Many thanks to our fantastic physical education teacher Mrs. Irvine for coordinating Browning’s 5th Annual Fun Run on May 21st to support a sense of community, charity, and physical fitness. All donations collected by the students (>$4000) were designated to the Leukemia Lymphoma Society in honor of Browning 6th Grader Jessica Baker. 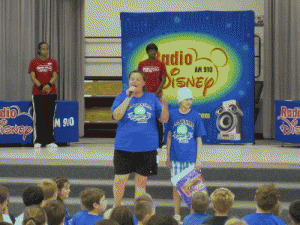 This year, we h ad a unique opportunity to make the Fun Run extra special for our students and reward them for their philanthropic efforts with a high energy assembly by Radio Disney. 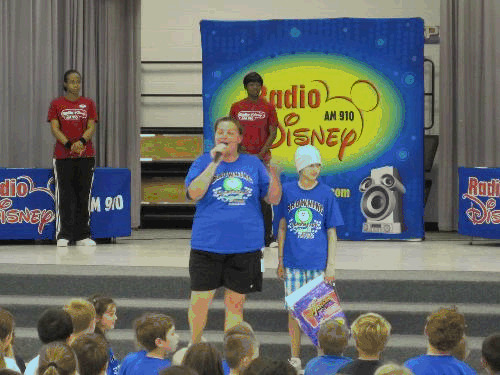 Students enjoyed a 1-hour performance featuring hit music, dancing, “game show” elements, and lots of prizes. This assembly would not have been possible without the generous support of Barron Industries, Detroit Sausage Company, TDIC, Inc./Waller Family, Goss Family, Schneider Family, Steixner Family, Pugh Family, Washeleski Family, Browning PTA, etc. Every sponsorship (large or small) was greatly appreciated! Once again, Mrs. Irvine has inspired our students to make a difference in the lives of others! 2010 GOLF OUTING Rocked it on Sunday May 16!!! Many, many thanks to Marcy, Pete & the rest of the Steixner family! Due to all of your hard work, efforts, & time, Browning earned over $2500 with our 1st ever Browning Golf Outing! Great Job! We all hope you consider co-chairing this event next year! WOW! Lisa Larson, Cheryl Troppens, May Michelak did an amazingawesome job of organizing this year’s Browning the Best Fun Fair on June 4, 2010, from 6-9 PM. Much to our delight, they earned >$5000 for the school from this family fun event! Bless you ladies for your continued support! We greatly appreciate all of the volunteers for these event!!! Many thanks to Cindy Werbrouck for chairing/coordinating this family fun event! As a result of her efforts, Browning earned >$700! Great job Cindy! Along with reading, writing and arithmetic, students are learning a whole new set of “The Three Rs” – and many of those students have been recognized for their efforts to Reduce, Reuse and Recycle to help the environment. Four Warren Consolidated schools and 12 in the Utica Community Schools district were recognized by the Macomb County Board of Commissioners as official Michigan Green Schools on April 22, Earth Day. Schools met 10 criteria to achieve the status, including a variety of actions that result in energy savings and environmentally friendly activities.